German Talmudist and cabalist; born at Worms at the end of the sixteenth century; died at Vienna about 1667. 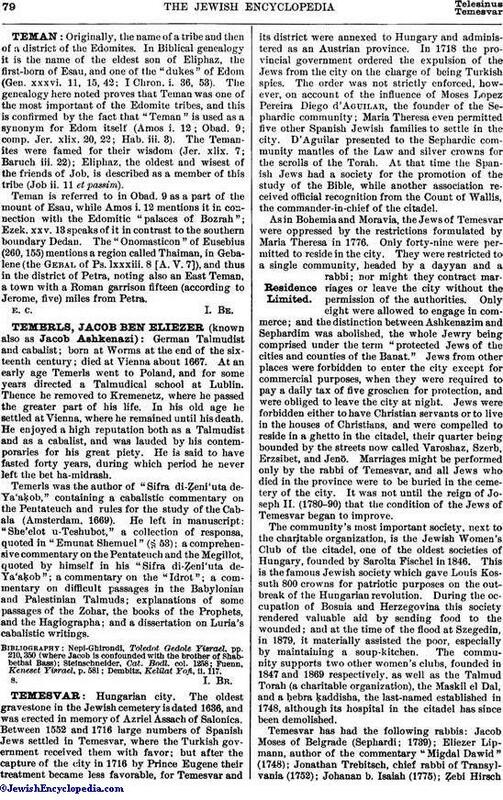 At an early age Temerls went to Poland, and for some years directed a Talmudical school at Lublin. Thence he removed to Kremenetz, where he passed the greater part of his life. In his old age he settled at Vienna, where he remained until his death. He enjoyed a high reputation both as a Talmudist and as a cabalist, and was lauded by his contemporaries for his great piety. He is said to have fasted forty years, during which period he never left the bet ha-midrash. Temerls was the author of "Sifra di-Ẓeni uta de-Ya'aḳob," containing a cabalistic commentary on the Pentateuch and rules for the study of the Cabala (Amsterdam. 1669). He left in manuscript: "She'elot u-Teshubot," a collection of responsa, quoted in "Emunat Shemuel" (§ 53); a comprehensive commentary on the Pentateuch and the Megillot, quoted by himself in his "Sifra di-Ẓeni'uta de-Ya'aḳob"; a commentary on the "Idrot"; a commentary on difficult passages in the Babylonian and Palestinian Talmuds; explanations of some passages of the Zohar, the books of the Prophets, and the Hagiographa; and a dissertation on Luria's cabalistic writings. Dembitz, Kelilat Yofi, ii. 117.